A screen tent (also called a shade tent or dining shelter) is a tent with mesh walls and a solid roof. Some models also have a floor. They are a refuge from mosquitos and other insects! 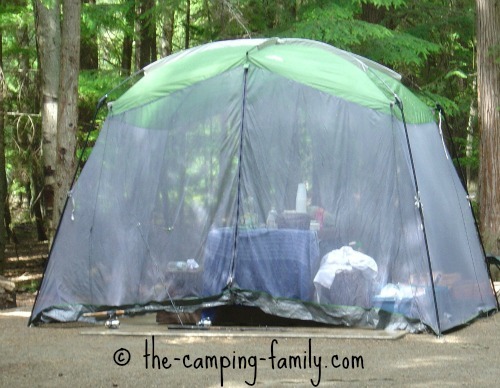 A shade tent isn't a necessity, but it can certainly come in handy! Read through this list and decide whether a dining shelter would enhance your camping trip in these situations. Let's face it: it's going to rain sometimes. During a gentle rain, it's great to be able to sit comfortably inside the tent walls, playing games around the picnic table - instead of crowding with your family in the sleeping tent. 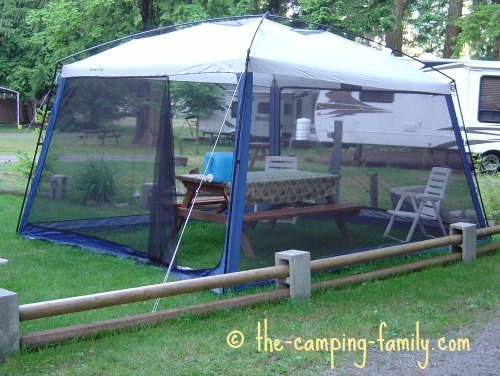 A screen tent can be a cool oasis - especially if your campsite doesn't have shade. The mesh walls allow the breeze to enter, and the roof shelters you from the sun. You can sit inside the dining tent enjoying your food without being bothered by flies, wasps, and other annoying insects. When you go to the beach or to town, store your gear and belongings in the tent. 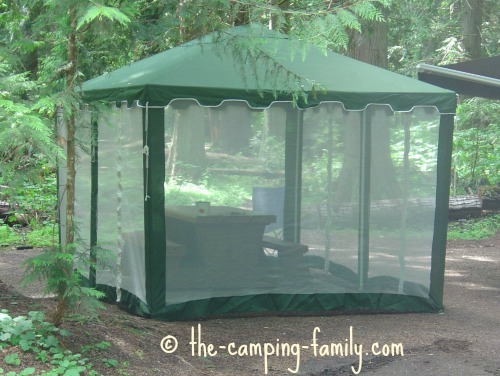 Once the mosquitoes come out, you can take shelter inside the screen house. That's easier and more pleasant than soaking yourself in mosquito repellent! Click here for more ways to protect your family from mosquitoes. When you retire for the night, store your lawn chairs, bicycles, toys and gear in the dining tent. They'll be sheltered from any overnight rainfall. 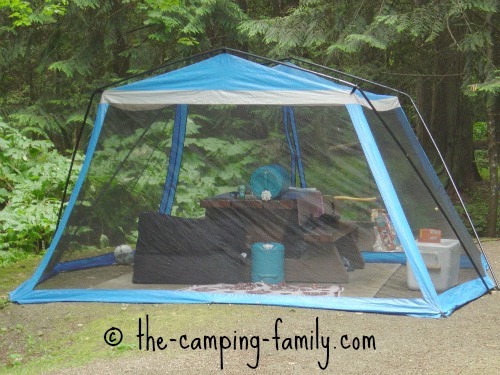 If your sleeping tent is unbearably warm, you might even want to sleep in the screen tent! Don't expect to use a screen tent as your only sleeping tent, though. Dining tents are not designed to keep you warm and dry. For sleeping, you need a three season tent or a four season tent. Screen houses come in a variety of shapes and sizes. Most are large enough to fit a picnic table. Others can fit not only a table but also several chairs. There might even be room for a highchair or a playpen! As with most things, you get what you pay for. Don't be seduced by low prices. If a price seems too good to be true, it probably is. If you buy a good quality tent, you'll enjoy it for years. Not all of these features will be important to every family, but these are the things I would look for. This mesh has tiny holes that will keep out even the smallest flying insects. These roll down to keep out the rain. The sun will quickly degrade fabric that doesn't have UV protection. 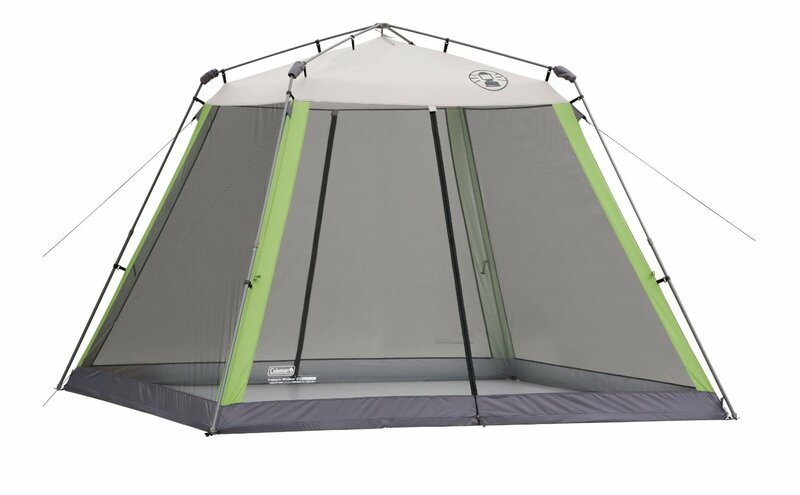 You'll want to be able to easily get into the tent with your gear. There's nothing more frustrating than a zipper that jams! One or more awnings will increase the shade area of your tent - which is especially important if your campsite has little or no shade. Most screen house owners recommend buying a model without a floor. Part of the beauty of a screen house is that you can come and go as you like, without worrying about getting the tent muddy. This is a personal choice, of course. Ideally, one person should be able to set up the tent in a relatively short period of time. You want setting up camp to be as simple as possible. The "Eureka Northern Breeze" has all of these features. You can even get an optional snap-in floor if that's what you prefer. Take a look! To see how easy it is to set up the tent, fast forward this video to 2:45. To see the Northern Breeze fully assembled, go to 4:45. Click here to see the Eureka Northern Breeze on Amazon. to be a weather-proof tent! The things that make a screen tent so comfortable and enjoyable - its high profile and mesh walls - mean that it is not going to stand up well to high winds and driving rain. If most of your camping is done in those conditions, you need a good quality dome camping tent - not a screen tent. The good news is that you can improve your screen house's performance in poor weather. Purchase some heavy duty stakes and extra guy lines. If bad weather threatens, use these extras to beef up your tent's weather resistance. Buy a couple of replacement poles, just in case. Experiment with the angle of your poles to allow rain to flow away from the tent. 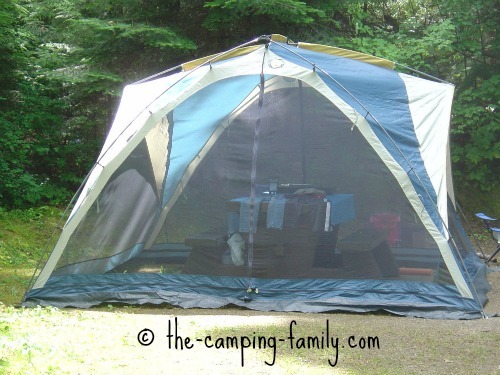 If the tent has awnings, try pulling the bottom of the awning poles close to the tent, at about a 45 degree angle. Be realistic about your tent's purpose. 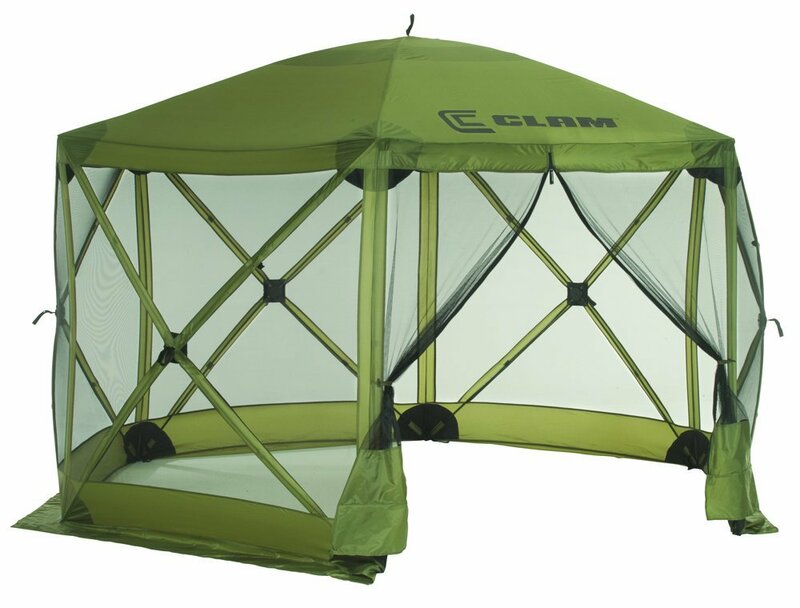 Don't expect to stay dry in a screen tent during a raging storm. That's what your RV or dome tent are for! If you don't have a weatherproof tent or an RV, you may want to head into town for an afternoon of shopping until the storm is over! 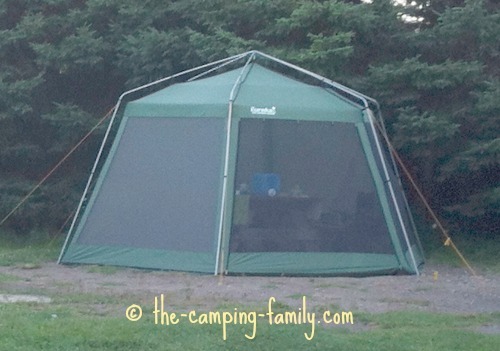 If you leave your campsite set up all summer and visit it only on weekends, don't leave your screen tent set up when you are away. More than one camper has come back after a storm to find a screen house collapsed in a soggy puddle on the ground. Great! You've decided that you want a screen house, and you've decided on the size and the features you want. Now what? Do your research. Quality varies widely from brand to brand. Read tent reviews online, talk to friends who camp, and chat with tent owners you meet in campgrounds. 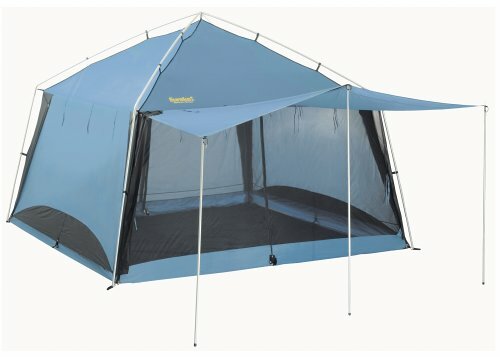 Visit camping stores if possible, and have a look at the various models. Try the zippers and use the doors. If you have lots of room in your vehicle, you may want to consider the Clam Screen House. This might be the easiest screen house to set up. Many reviewers report that they can do it in less than 2 minutes! It's taller than many screen tents, too: more than 7 feet tall in the center! The only downside is its packed size. Since it's more than six feet long, it won't fit in smaller cars. If you're looking for an inexpensive tent, consider this one. It protects well against mosquitos, but no-see-ums can get in through the mesh. You'll want to use extra care when putting up and taking down an economy-priced tent. When you get your new tent home, read the instructions! Then practise putting it up. 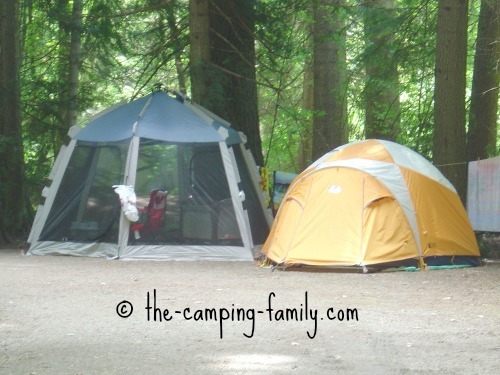 Here are some tips for pitching a tent. 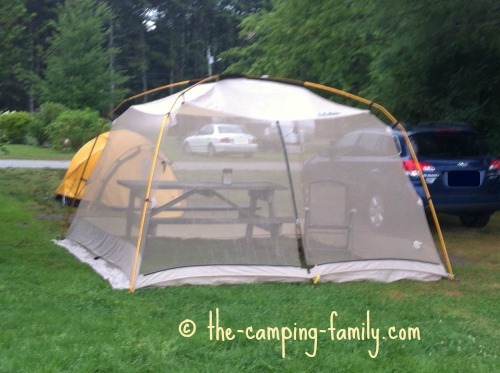 Don't expect a screen tent to be your only camping tent. Screen houses are not designed to be sleeping tents. 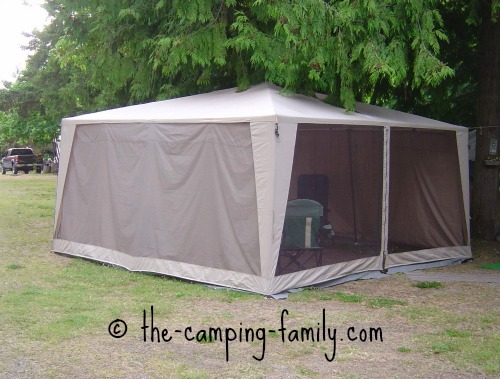 A shade tent won't protect you from wind and storms the way a good quality camping tent will. But for shelter from sun, bugs and light rain, shade tents are great! Now that you know whether or not a screen tent is for you, click here to learn about the other types of tents for camping. For information on every aspect of planning your next camping trip, visit The Camping Family home page.